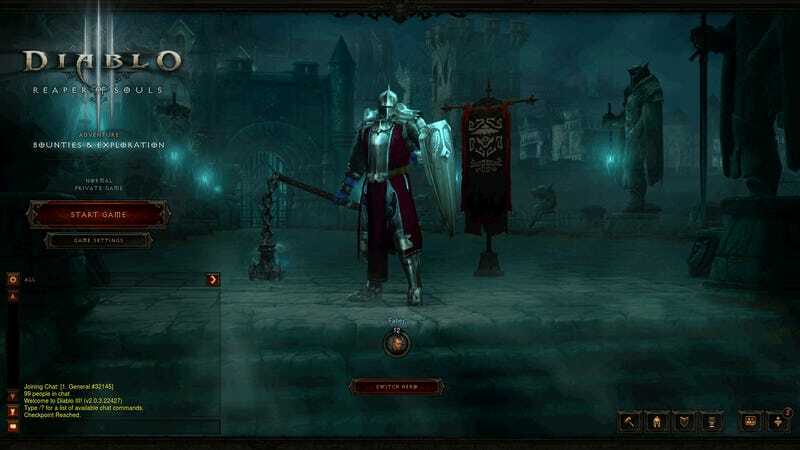 Farewell, Diablo III story mode. You had a nice long run, but now that I've completed Reaper of Souls' fifth chapter, there's no reason for me to replay you ever again. It's adventure time! 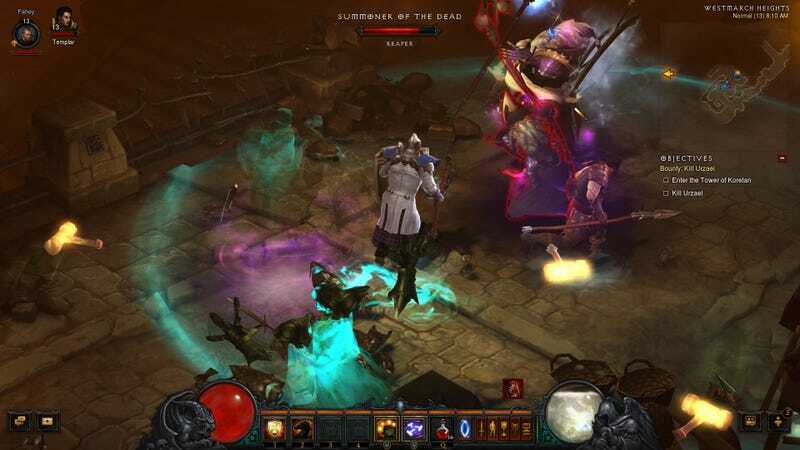 At first glance the Reaper of Souls expansion for Diablo III felt really light on content. The largely uninspired Act V of the story only took me three hours to complete, and while the defensive Crusader class is lovely and all, I dreaded the thought of trudging through all five chapters all over again several times to unlock its true potential. But a glorious thing happened when I completed Act V with my Demon Hunter. Adventure Mode unlocked for all of my characters, forever changing the way I play Diablo III. Adventure Mode opens up all of Sanctuary to any of a players' characters, regardless of level. 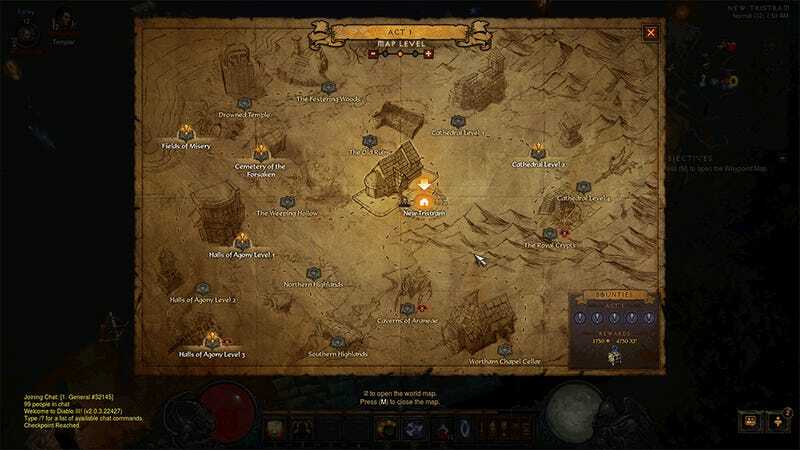 Each of the game's five chapter maps are populated with five random bounties, tasks such as "Defeat this boss" or "Clear out this dungeon level". It's a total loot scoot, complete with randomly-generated special events. Simply port to the area your bounty is in, fight your way to the goal, and then immediately teleport to the next bounty. Completing all five rewards the player with experience points and gear. Players will also obtain Rift Keystones as they play through dventure Mode, which can be used at a Nephalem Obelisk to open Nephalem Rifts. These are massive random battlegrounds populated by hordes of creatures, the killing of which slowly fills a meter. Once the meter reaches capacity, a powerful Rift Gaurdian spawns near the player, promising a tough battle for some lovely loot. If you skip to the last 30 minutes or so of this past weekend's Saturday Stream video, you can watch me defeat a Rift Guardian by the skin of my teeth. So we've got bite-sized quests, open access to the entire game world, challenging random boss battles and an entirely new and exciting way to level up characters. It's all I ever wanted. The expansion might be called Reaper of Souls, but the eponymous Malthael is but a brief and forgettable dalliance. He's a stepping stone to the real meat of the first Diablo III expansion pack. So until Blizzard releases another expansion pack with an additional chapter of story to flit through, Adventure Mode is what's happening.